Burlington Yoga offers traditional hatha, vinyasa, alignment, and breath based classes in the heart of downtown Burlington since 2001. Burlington Yoga's mission is to provide a supportive, focused atmosphere accessible to students of all levels to develop and nourish their individual practice. At some point, every person who practices yoga had to walk into a class somewhere, unsure of what to expect and unfamiliar with the rhythm of studio. From start to finish, here's what you can expect when you come to Burlington Yoga for the first time. Private instruction is a remarkably effective and efficient paradigm for learning yoga. The idea of a "yoga class" is relatively new. Traditionally Yoga was taught one on one or in small groups and tailored to the specific needs and proficiency of each student. We also offer private and small group yoga lessons at our sister yoga studio in Shelburne, Vermont. 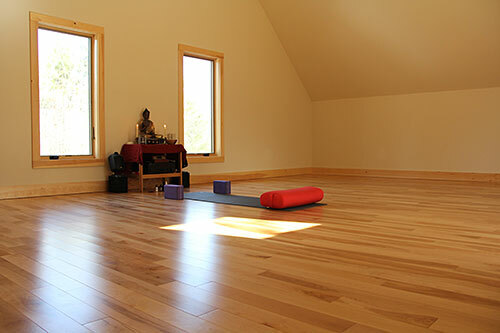 The Shelburne Yoga studio is a quiet, intimate space conveniently located off of Spear Street in Shelburne, Vermont. The space is beautifully lit with natural light and views of the surrounding forest. High cathedral ceilings and radiant heated hard wood floors make for a warm and comfortable space for you to relax and develop your practice. Unlimited classes. Monthly or Yearly Payments. ​Take your practice to the next level. ​"There is one way of breathing that is shameful and constricted. Then there's another way: a breath of love that takes you all the way to infinity."